I have finally had a chance to use the chalkboard vinyl that came with my Silhouette Cameo. I used it to help find cookie cutters when I need them. A few months ago I decided to gather all of my cookie cutters and try to organize them. I had them in various places all over my kitchen and I could never find the one I wanted. I gathered them all up and put them in simple plastic containers I got for a dollar at Walmart. I shoved them under a cabinet and have dealt with this for a while. Even though they looked more organized, they weren't. I had divided them evenly into categories in the boxes, but it still wasn't easy to find what we needed. We would have to pull out each box and look at it to see what it was. And, I found that the cutters were being returned to the wrong box after they were used. I wanted a non permanent way to label them because I tend to change things around quite often (don't tell my husband, I keep telling him he is imagining it). I decided to test some of the label designs I made in the Silhouette software. I opened one of my files where I had just played with different shapes (and some brackets) trying to make some nice labels. I picked one of the more simple designs I had made and copied it into a new file. 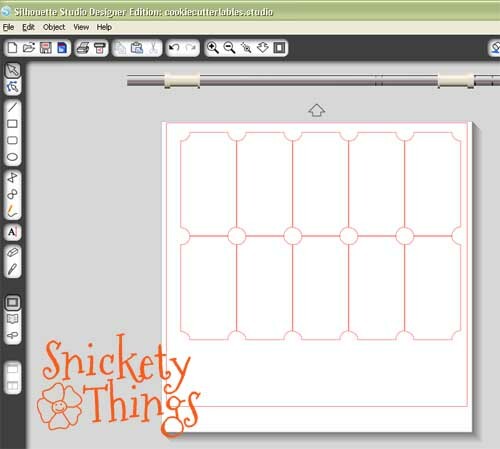 I made it with a rectangle, then just used a circle to cut the corners out. I just resized it to around four inches by two inches and rotated it. Using the duplicate feature I just fit as many as I could into two rows. I only needed six, but I now have a few extras. Then it was just a matter of sending them to the Cameo to be cut and applying them to my containers. I just hand wrote the contents with a chalk marker. What I use most are the sandwich cutters when I make lunch for my girls. I also use circles/hearts/flowers and the leaves so I put those on top. I actually use almost all the cutters more when I am making lunch than for making cookies. You are only getting to see about two thirds of the top shelf of this cabinet. I had to crop the rest of it out so you couldn't see the jumble of cords and appliances that I use. I plan to make some more things with the chalkboard vinyl soon. I'm thinking of one of those _________ many days until ___________ signs I've seen on Pinterest. The kind you fill in the blanks yourself so it changes with what is going on. What would you make with the chalkboard vinyl? Love this! 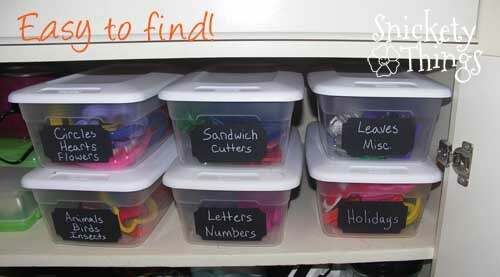 I'd make labels for my classroom!! Thanks Jenny! I love the chalkboard vinyl. 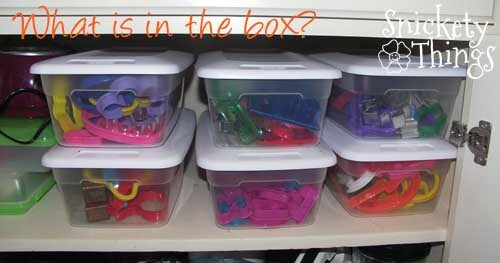 This is actually a very smart way to organize your cutters. Thank you for stopping by! Sundae Scoop is always a fun party. Great idea. I love bins, so I'm surprised I haven't thought of organizing cookie cutters right now because currently they're in bags or the mega box they came in. 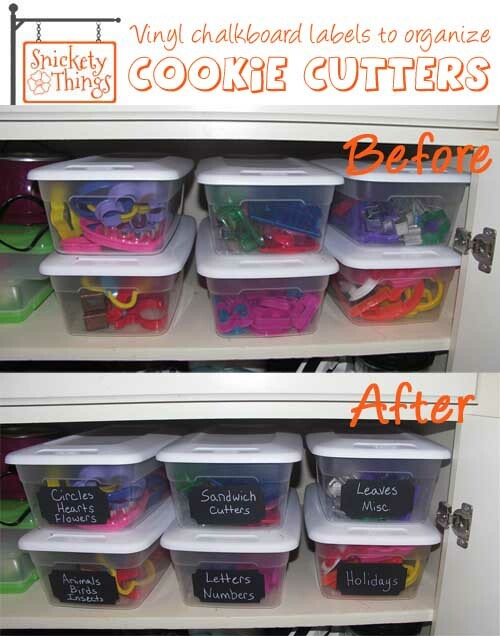 I now want to organize my cookie cutters immediately. Thanks, mine were in all kinds of places before. I didn't know about it either! It came with my Cameo with the discount code I used. We've been doing it for a week now and it is so handy. Even my girls can find the one they want easier. Great idea! It is amazing how cookie cutters can take over! I never realize I had so many! I love that you have a box labeled for sandwich cutters! Thanks! I have a lot of sandwich cutters. My girls don't really eat the crusts, so I can at least give them fun shapes. I love those chalk board signs, they change the whole look instantly! chalkboard vinyl? something new... thanks for sharing with us. Im ur new follower. I would love to see you come to my blog..
great idea!I am visiting from the sassy sites link party. I am you newest follower! I blog over at http://www.garagesalesrus.blogspot.com/ I hope you will stop by and do the same. 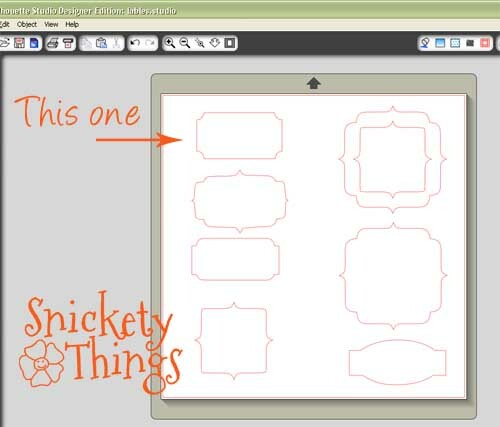 I also have an awesome giveaway going on with a Cricut Machine! It's only got a few hours left on it so hurry over and enter! That was my original problem. I had so many catch all bins that I had to separate them out. These are still working very well for us.